b) they may consider you small fry and simply could not be bothered engaging you. If you could persuade a neutral party to broker the debate, say DLSU, UP or Pagasa to sponsor a summit on global change... there may be a better chance of a face-to-face graph-for-graph encounter. For these issues, playing before an audience is important. I thanked my friend for his analysis. Aside from the 2 reasons that he gave, the main reason I can think of, is that they are simply lazy to read on scientific blogs and sites that give daily perspectives and data on climate. The most convenient reply is, "it's a settled science by thousands of climate scientists". I personally heard that reply to some friends who can't keep up a verbal debate with me on small/ friendly talks. Last January this year, during a big forum at the UP College of Law, the topic was on climate and the College of Law auditorium was bursting with so many people. Among the speakers were Dean Tony La Vina of the College of Law, also of the Ateneo School of Govt, and Dr. Mahar Lagmay of UP National Institute for Geological Studies (NIGS). During the open forum, I was the 1st or 2nd to ask question, precisely to start even a small debate as all speakers in the forum were all warmers. I said that all their projections on climate mitigation are based on the wrong data and assumption, that the planet is ever-warming when recent and past temperature records show a cycle: warming-cooling-warming-cooling, due to natural factors (the Sun, GCRs, oceans, volcanoes, water vapor, etc.) and CO2 plays very little or zero impact on climate." Dean Tony La Vina's answer was evasive, something like "I'm not a scientist to comment on that, but the IPCC reports say that..."
Mahar replied that "rising sea level is true... there are some areas in M.Manila that are already slowly sinking." Of course I wanted to make a follow up question but there are many others who raised their hands, and almost all of those hands were asking what we can do to "fight climate change". 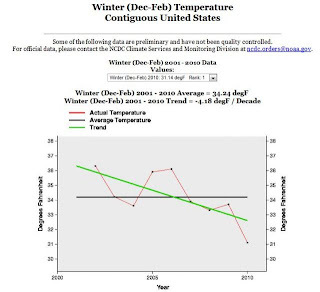 US Winter Temperatures Dropping At A Rate Of 40 deg F Per Century. The current decade, 2000-2010, is also the snowiest decade (Dec. to Feb.) in the Northern Hemisphere, beating even the global cooling of the 1970s. 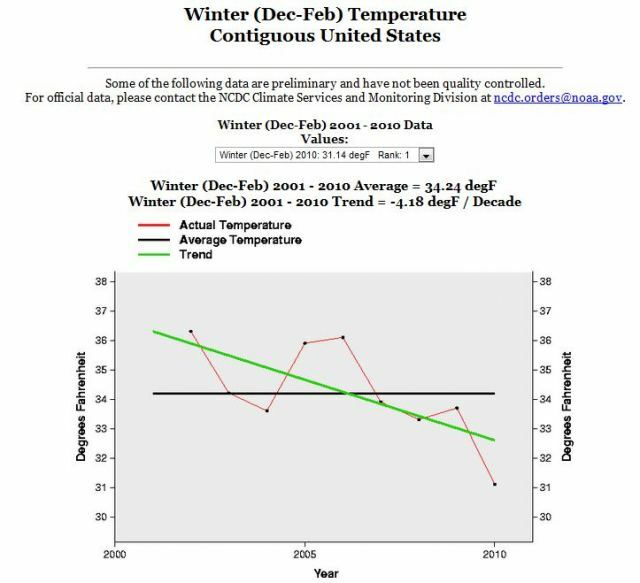 See more graph and discussion here, http://stevengoddard.wordpress.com/2010/11/14/us-winter-temperatures-dropping-at-a-rate-of-40-degrees-per-century/. Click this and succeeding graphs for bigger images. I will admit that I'm a "small fry" compared to the established global warming rent-seekers like Greenpeace, WWF and Oxfam. But who's the "big fry" skeptic or non-believer of AGW in this country? I know a few academics, like Dr. Perry Ong of UP Biology Department, but there is no big media person, big politician, big NGO, etc. who question AGW. I also challenged some friends in facebook or engage them in debates on climate. After sometime, they run out of arguments. I also confronted Greenpeace on twitter, replying to them on climate stuipidity, but even on twitter, they are cowards. Last April 2009, I've faced the head of the Manila Observatory, Ms. Loyzaga, in a talk at the Rotary Club of Makati McKinley, she did not defend the IPCC and the AGW "science" even if I explicitly attacked those. She only talked about the danger of the Philippines being more prone to climate change and rising ocean. I also gave a talk last November 2009 at the Rotary Club of Makati Dasmarinas, and the organizers asked me to be a reactor to the head of WWF, Mr. Lory Tan, who will be their speaker the next week. I said "go-go-go." But a few days before his talk, I was advised not to come because it might cause "divisiveness" in the club. I think it was a diplomatic way of saying that Mr. Tan does not want a debate, Like Al Gore, like IPCC head Pachauri, like Leonardo di Caprio, etc. More environmental regulations by governments and the UN. More energy taxation and regulations by governments. More climate bureaucracies by governments. More (and endless) global climate meetings by govts, environmentl NGOs, media, etc. More carbon trading by Al Gore companies, Goldman Sacchs and other rent-seeking businesses. Been cloudy for several weeks now (except the last few days). The current La Nina in the El nino - La nina - El nino - La nina cycles, would seem to be more harsh than the previous La Ninas. Top warmer campaigners though would say that "look, another evidence of man-made climate change! global warming exacerbates the cooling!" 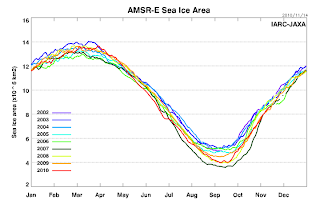 And ice in Antarctica is starting to melt, currently at around 16 million sq. kms. 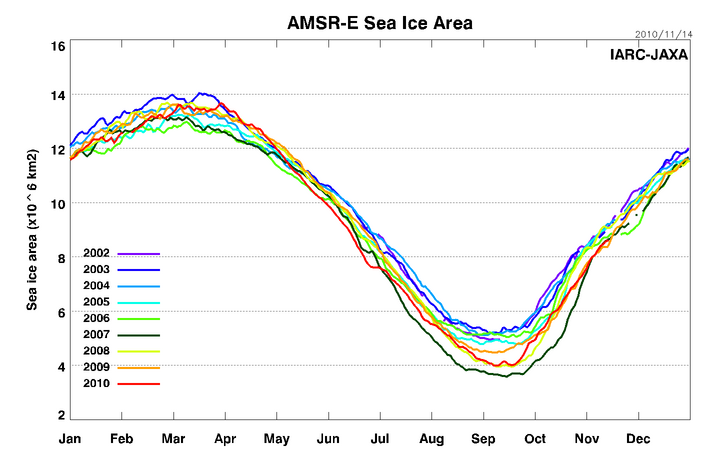 Same source as above graph on Arctic ice. 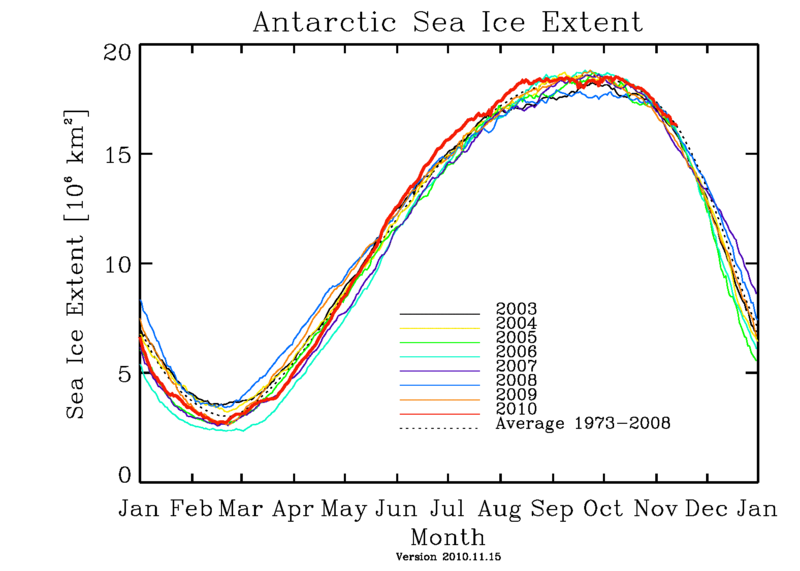 The lesson remains: polar ice, like other weather and climate patterns, run on cycles. 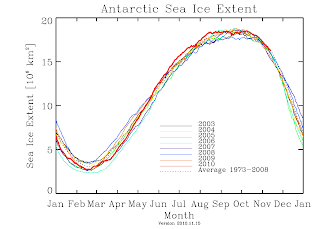 There is no such thing as "unequivocal, ever-warming climate and ever-melting ice".